When I approached the man working at this auto shop and asked if this little lady was in for a tune-up he was initially confused but got the joke soon enough. 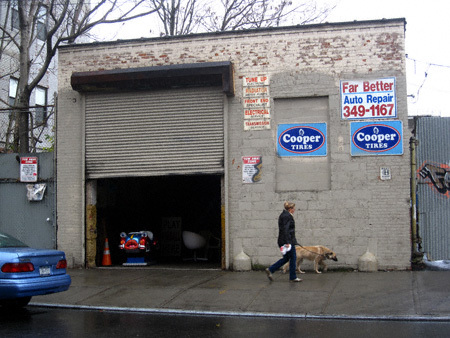 If this petite set of wheels looks strangely familiar to a number of you, here’s why: she used to belong to Manhattan Avenue’s very own the Corner Frenzy. 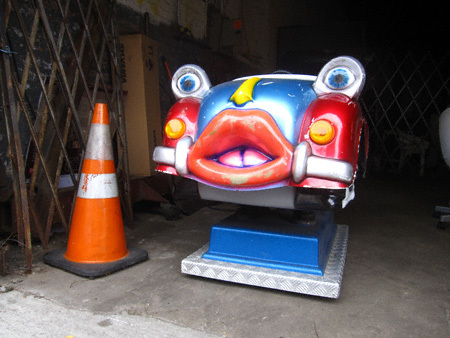 Now she will be an attraction at Far Better’s Auto Repair & Pinball Arcade (which I wrote about last month). This has to be one of the most inspired joint ventures capitalism has ever spawned— and it comes courtesy of (where else?) the Garden Spot of the Universe! I did recognize that ride from the corner where she used to reside. Since I took that photo, they had painted over the extra graffiti. I think only the “Far Better” remains. anyone interested in making a prank call? pls. dial (718) 349-1167 and ask them to turn the mechanical toy ride noise down. the noise this little car makes is one of the more annoying things that i’ve ever heard, and it goes off EVERY FIVE MINUTES.